Leading the campaign from the front, Hon’ble Minister for Railways Shri Suresh Prabhakar Prabhu launched Swachhta Saptah under the Swachh Rail Swachh Bharat Mission from New Delhi Railway Station today(17.9.2016). In order to spread wider awareness on sanitation and cleanliness in rail premises and make hygiene a habit amongst the travelling public, the Indian Railways is organizing a special nine-day long public outreach programme scheduled from 17th September to 25th September 2016. Stating that this day coincidentally marked the birthday of Prime Minister Narendra Modi, Shri Prabhu said that it is befitting that the Swacchta Saptaah should commemorate his lofty vision and goals. 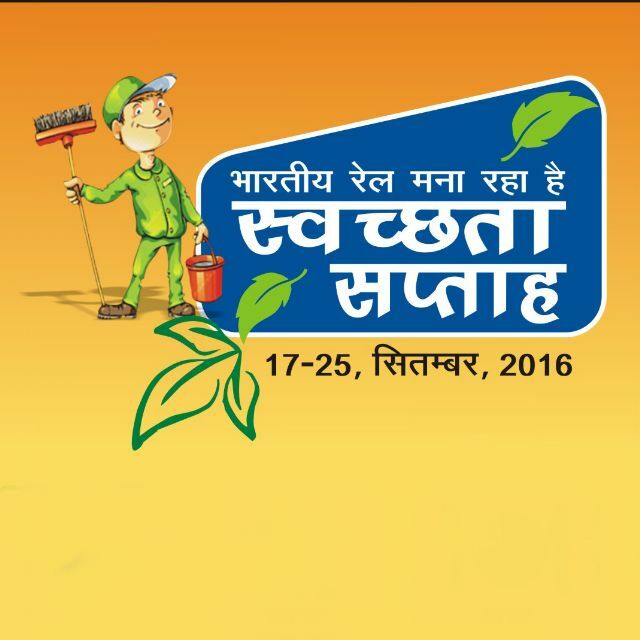 Commencing the Swachhta Saptah today (17th September 2016) as Swacch Paryavaran Diwas(Clean Environment), the Hon’ble Minister spelled out the Railway’s commitment by recounting the initiatives taken under the Swachh Rail Swachh Bharat Mission. He also felicitated railway employees Shri Jagdeep Hooda, Coach, Indian Boxing Team & Shri Lalit Mathur, Athlete Player of the Indian Relay Team at Rio Olympic2016 on the occasion. Senior Railway Officers present on the occasion include Shri Ved Pal, Add. General Manager, Northern Railway, Shri Devesh Mishra, Chief Commercial Manager, Northern Railway and Shri Arun Arora, Divisional Railway Manager, Northern Railway, Delhi. Lending their valuable presence to this cause, the sportsmen who were honored participated with enthusiasm accompanied by cheers and gusto from Railway officials and crowd of rail passengers at the venue. Commencing with ceremony on a big note and with great enthusiasm General Manager, Northern Railway Shri A.K.Puthia launched the the Swachhta Saptah today at Dehradun station. Various activities held at the station include Nukkad Natak by Scouts and Guides, Cleanliness drives and awareness campaign by SNCF Volunteers. He inspected equipment, materials & machines used for cleaning at stations & in trains and interacted with passengers and with press and media. In keeping with the progam, Northern Railway undertook intensive cleanliness drives on all stations. All stations wore the ceremonial look with posters and banners spelling the message loud and clear to the travelling public that the Railway is their travelling home. Railway officer and staff donned the ceremonial caps interacting with the travelling public and conducting inspections at station premises. Anti-littering slogans were posted at various locations. Dustbins for garbage were provided and awareness programmes were undertaken. All major stations on the Northern Railway were inspected by all levels of hierarchy from top executives and supervisory cadres. A drive on garbage handling and disposal was also undertaken at railway stations, Trains and Depots. Tree plantation ceremonies were held at various places. Earmarking each day with specific focus area for spruce-up, the cleanliness programme has certain defined thrusts like Swachh Stations (Clean Stations), Swachh Railgaadi(Clean Train), Swachh Neer(Clean Water), Swachh Parisar(Clean Complex), Swachh Sahyog(Cleanliness Participation), Swachh Samvad (Cleanliness Dialogue), Swachh Samarpan (Dedication for ensuring Cleanliness), Swachh Aahar (Clean Food)upto 25th September 2016. Northern Railway is committed to continue this Cleanliness drive on sustained basis. The Railway appeals to all rail users to express their solidarity throughgreater public support and an active public co-operation to make the Railways a place of pride and rail journey a pleasant experience. Public participation and accountability building are being increasingly acknowledged as concomitant factors in transforming the cleanliness profile of railway stations. Swacch Rail Abhiyaans, Rail Upbhokta Pakhwadas, Public Opinion surveys – are recent initiatives that have shown that the public is interested in engaging with Railways in maintaining cleanliness at stations. In recent times, co-opting Charitable and Voluntary Organisations in the Swacch Rail, Swacch Bharat Mission has been one of the strong impactful measures by the Railways. Public participation has also been a forceful communication platform that the Railways have managed to achieve. Voluntary organizations have participated with Railways in enhancing aesthetics of station like Hapur through mural paintings. On October 2nd 2014, when Hon’ble Prime Minister of India launched the Swachch Bhaart Mission, the Indian Railways had been more than a willing partner in this mission. Tagging along with this lofty endeavor Hon’ble Minister of Railways. initiated the Swacch Bharat campaign at New Delhi station. This special drive which could be termed as one of its kind massive cleanliness campaign includes “Shramdaan” and awareness activities to ensure greater level of hygiene and sanitation at stations, at workplaces, at workshops as well as at the railway colonies. Northern Railway officers and staff undertook the cleanliness pledge at all divisional headquarters office and at various stations. A comprehensive “Cleanliness Action Plan” was formulated covering stations, tracks, workshops, railway colonies etc for keeping the sphere of work neat and clean. Deterrent action was taken against Rail users and catering contractors of trains who are found dirtying the railway station premises and railway tracks and heavy penal fines were imposed on them. A fine (upto Rs. 500/-) was imposed upon passengers found littering Railway premises. New Delhi Railway station, one of the busiest stations in country. A total no. of 351 trains arrive/depart from this station with a total footfall of 5.20 lacs passengers each day. A total of 433 staff are deployed for cleaning at the New Delhi Railway station. Emphasis is laid on mechanized cleaning and indigenous innovative track cleaning cars complement the herculean task of track cleanliness. As cleanliness took centre-stage in the country’s journey to modernisation and progress, NGOs and charitable institutions expressed interest and offered voluntary services and Swachch Bharat Mission – Phase 2 was launched on the occasion of Gandhi Jayanti Buttressing efforts of Railways to ensure cleanliness in trains, at stations and in public interface areas, on the solemn occasions of Gandhi Jayanti and on Rashtriya Ekta Diwas(Sardar Patel Birth Centenary) volunteers of Charitable Institutions/Social organizations like Sant Nirankari Mission(NGO), Patanjali Yogpeeth & Sant Nirankari Mandal, Haridwar, Radha Swami Satsang, Beas, Parmath Niketan, Kailash Ashram, Rishikesh participated in Swacch Rail Swacch Bharat Abhiyan. As part of its social service endeavor, Sant Nirankari Mission participates in monthly station cleanliness through shramdaan endeavors drives at New Delhi station premises in the Swacch Bharat Mission. About 400 volunteers participate in the cleanliness drive every month. Fortnight long cleanliness drives are also launched on regular basis wherein a team of officers are deputed for ensuring cleanliness and put up daily report. As part of this campaign, efforts are also made to ensure the involvement of passengers and to educate the masses about the necessity of keeping the railway premises clean. This was carried out through regular announcements on the public address system, prominent posters, airing of cleanliness messages and clippings on CCTVs, and distribution of pamphlets, posters, stickers and banners containing cleanliness messages among the travelling public. Deterrent action was taken against Rail users and catering contractors of trains who are found dirtying the railway station premises and railway tracks and fines were imposed on them. A fine (upto Rs. 500/-) was imposed upon passengers found littering Railway premises. A total of 66,108 cases of littering were detected and an amount of Rs 66.83 lacs was realized as fine during 2015-­16. Citizens were encouraged to come forward and participate wholeheartedly in this campaign. Further, Nukkad Nataks were organized at railway stations, railway colonies and railway offices to motivate the Railway staff to keep their workplaces clean. Railways were assisted in this endeavor by Civil Defense officials, NGO “Chintan” which helps in segregation of waste and schoolsalong with Scouts and Guides from Railways. Rail passengers and the public now voluntarily throw waste, paper etc in the dustbins. These endeavours would continue till cleanliness becomes a habit with rail users. The Railway appeals to all rail users to express their solidarity through greater public support and an active public co-operation to make the Railways a place of pride and rail journey a pleasant experience. Delhi Jn is also one of the busiest stations on Northern Railway dealing with more than 250 Mail/Express/ Passenger trains and with a footfall of two lakh passengers each day. It is one of the prominent stations in the national capital which figures in Swacch Bharat Mission. A total of 272 staff are deployed for cleaning at the Old Delhi Railway station. A massive 24 Hour Mega Cleanliness Drive at Old Delhi railway station on 23.06.15. A total of 560 staff were deployed for cleaning of trains and station premises at Old Delhi Railway Station. Eight multi disciplinary officers were deployed from midnight onwards to monitor the drive. JCBs and dumpers were pressed into service during this cleanliness drive. 20 tons of garbage besides 14 dumpers & 2 BRN wagon filled with garbage were cleared from the station premises during the 24 hour drive. Seven Checking Squads comprising of personnel from RPF and Commercial Department had been deployed at the station to keep a check on people littering and dirtying the station premises. Stress was laid on mechanized cleaning also and super sucker and hydra cranes were used apart from mechanized cleaners. This brought a visible improvement in cleanliness standard at Old Delhi Railway Station. Fortnight long cleanliness drives are launched on regular basis wherein a team of officers were deputed for ensuring cleanliness and put up daily report. Sant Nirankari Charitable Foundation personnel participated in a cleanliness campaign at the station on 02.10.2015 on the occasion of Gandhi Jayanti (Swachch Bharat Abhiyaan -Phase 2) and 31.10.2015 on the occasion of Rashtriya Ekta Diwas. This foundation conducts cleanliness drives every month at this station since the inauguration on 02.10.2015. About 400 volunteers participate in the cleanliness drive every month. Fortnight long cleanliness drives are launched on regular basis wherein a team of officers are deputed for ensuring cleanliness and put up daily report. There has been visible improvement in the cleanliness at this station. Meanwhile the Railway has also been undertaking plans to buttress the efforts on sanitation through infrastructure improvements like provision of additional toilets, washable aprons for easy drainage of tracks etc. Integrated cleanliness contracts will be awarded Stepping up its public awareness campaigns through Nukkad Nataks, Short-films, posters, Northern Railway appeals to the rail users to participate in this endeavour through proper use of toilets and dustbins. Public participation through maintenance of cleanliness would be inflexion point in this journey. The spin-off would be a definite win-win score-card. Cleanliness of railway tracks especially at railway station areas remains a Herculean task involving great effort and large amounts of time, as despite regular and frequent cleaning efforts tracks are normally littered with all kinds of waste such as polythene, paper bags, plastic bottles, torn clothes, unconsumed food, litter etc. Besides unauthorized settlement along the tracks also poses a safety challenge in both running of trains and to the human lives residing alongside tracks. This stretch along the tracks between Narela and New Delhi has vast population residing beside it, which mainly includes unauthorized occupation of Railway Land on this stretch. The occupants of these slums throw garbage on the Railway land and also defecate on this land. This stretch besides the tracks was very dirty and Hon’ble NGT had also taken stern view on this. Delhi Division took this as a challenge and transformed the picture in a year’s time. To ensure this the broken boundary walls were repaired. The accumulated garbage was removed by using JCBs and dumpers. The track cleaning machine designed by Delhi Division was also put into used to clear the garbage accumulated on the tracks. A lot of earthwork was done to level the area on both the sides of the tracks. To beautify the area contracts for plantation have been awarded and work is in progress. In consonance with the orders of Hon’ble NGT orders notice for fine has been served to about 800 occupants residing along the tracks. At some of the places barbed wire fencing has been done to prevent people residing on the land besides the track from entering the railway land. Greater co-operation by all government departments and active public co-operation will remain the vital factors in making the Railways a place of pride and rail journey a pleasant experience.